Just dropping in to show you the cuff of the Charybdis sock...it's toe up, so that means one sock is done! yay! progress! 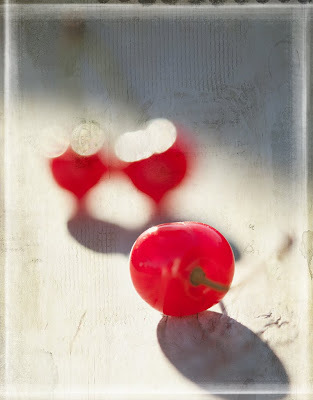 Those cherries are bright red, huh?! Sorry, wish I could stay longer...gotta run!! That last cherry soothes a roughness of my palate. Love the way that yarn is knitting up! 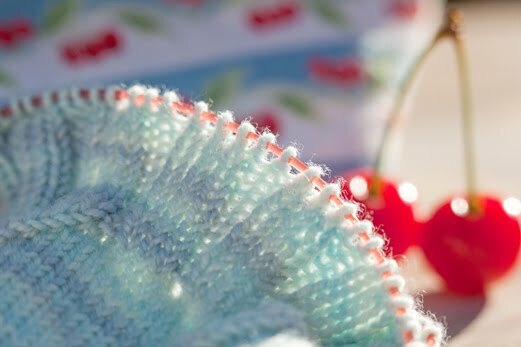 This makes me happy-- what a red- the baby blue yarn w the red needle backlit-- the neat blurred cherry fabric in the background-- the nice processing in #2. I think I need to have some fun with my eraser tool.